Last night I took the girls to the LSU Holiday Spectacular, which is a kick off event for the holidays hosted by the LSU Faculty & Staff Senate (I think). Like with the trick-or-treat down the row there is little information online about what to expect. But now that I've been I know! Although it's likely that they change things year-to-year, but here's what happened this year. For parking I think the Barnes & Noble parking garage is the easiest. It's just a few bucks and you have covered parking that's an easy walk to the Student Union, where the event took place. The girls also love any chance to ride in an elevator (on our way back to the car we rode to the top floor -- looked out over the campus at night -- and then rode back to 2 for our car). A lot of the people who come are already on campus though, so it's less of a deal for them to find parking! The event took place in the lobby area -- just up the middle outside stairs that face the quad. There weren't really signs or hordes of people streaming in, and there was some other Christmas-themed event with the Coca-Cola holiday truck and music playing outside. We figured out where to go when we saw the lighted Christmas tree inside. There was a front desk where we checked in -- handed over the food item donations (or you can take a toy for Toys for Tots) -- and the girls were each given a bag and a treat bag with candy and a coupon for something -- pizza and games at Mr Gatti's maybe. Then we went to the craft areas at different tables. Lots of different on campus offices were represented. The girls made ornaments, picture frames and colored some pictures. Jane even got to play the drums (thankfully while wearing headphones so only she could hear her stylings). After we did that section -- which was arranged around the line to wait to see Santa Claus (who we did not wait for -- if we'd had another adult to do the waiting that would have been fine, but we had to maximize our time and get home for bed at a reasonable hour) -- we went to the food area where there was free pizza, balloon artists and door prizes. A hot tip: go directly to the door prizes. There's no actual drawing. What you do is turn in your raffle tickets (and if you do it directly there's less chance of losing them!) and you get to pull a sucker from a foam tree. If your sucker's bottom is colored you win a prize! Livia and I both won, and we were lucky that they still had prizes left. They were running out by the time we made it over close to 7. I got a $20 Walmart gift card (the prizes are separated between kids and adults), and Liv's was a wrapped gift that turned out to be an Emoji game of some sort -- it has two vests with Velcro and several Velcro balls and you play tag with your sister trying to get the balls to stick to her vest. We're planning to try it out this afternoon -- I'm glad it's something the girls can share and seems like a good back yard game. Jane's sucker did not have a colored end, so she didn't "win," but they did give her a little bag of additional treats and candy that seems just as fun. There were also free drinks - as in Coke products and Dasani water. There was a lot of pizza, although we had eaten before we went to the event so we didn't try it. It was pretty crowded and with only one of me and two of them it was hard to maneuver and keep us together, especially as my hands got filled up with drying crafts, balloon creations and such. Another tip would be to bring a tote bag for your loot -- something you can sling over a shoulder instead of in your hands and would fit more than the small plastic bags provided. The event was 6-8 and we were there about 6-7:20. 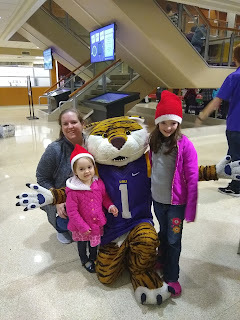 In addition to Santa there was Mike the Tiger, the Chik-fil-A cow, the Grinch (eeek! ), Mrs. Claus, a snowman and reindeer wandering around for pictures. I'm glad we checked it out, and I hope next year Shawn can come with us to help with the juggling of the stuff.